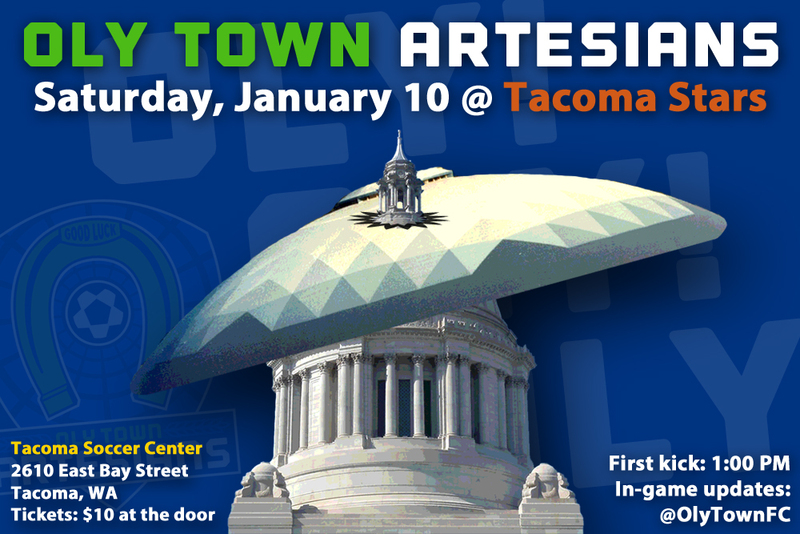 OLYMPIA, Wash. – The two closest teams in the Western Indoor Soccer League meet for the second time this season when the Oly Town Artesians (2-3-0, 6 points) travel to the Tacoma Soccer Center on Saturday afternoon to take on the undefeated Stars (4-0-0, 12 points). The Artesians look to snap a two game losing streak and avenge their 8-5 loss to the Stars in their first WISL game on November 22nd by giving the Stars their first loss across all competitions this season. It will not be an easy task. The Tacoma Stars are led by two time WISL Player of the Week and league leader in goals scored, Derek Johnson (11 goals), and have allowed a league low 15 goals. They are coming off a 9-1 drubbing of the Arlington Aviators in their last WISL game on December 20th and a much closer 3-2 win over Yakima United in a friendly last weekend. They open their second half having already clinched a playoff spot. The Artesians enter the game on a tough two game losing streak. Oly ended the first half of the season with a 7-5 loss to Bellingham United in Bellingham and then lost another close one to the Hammers, 9-8, last Saturday night in Tumwater to open the second half. Willie Spurr scored a hat trick in the week five loss and is second in the WISL with eight goals scored. Greg Wolfe is tied for third in the league with seven goals after scoring twice against Bellingham. Oly and Tacoma met in the season opener for the Artesians on November 22nd. Spurr put the Artesians up 1-0 with a goal early in the first quarter but the Stars ran off six straight goals and held on in the end to an 8-5 victory. Spurr scored twice in the game and was named WISL Player of the Week for his effort and both Johnson and Kyle Danielson recored a brace for the Stars. A win on Saturday would go a long way to qualify the Artesians for the WISL playoffs. Currently they sit in the fourth and final playoff spot, two wins ahead of the winless Arlington Aviators. A win would put them up by three games and would mean that Arlington would have to beat Tacoma, Bellingham and the Artesians when they meet in the final game of the season. First kick at the Tacoma Soccer Center is scheduled for 1:00 PM. The start time was moved up by 6 1/2 hours to allow players, fans and staff to watch the Seattle Seahawks game later in the evening without conflict. Tickets are $10 at the door or in advance at http://www.tacomastars.com. Follow the Artesians on Twitter @OlyTownFC for in-game updates. The Artesians travel to Wenatchee next weekend and will return home for a friendly on January 24th against the Oly Indoor All-Stars. First kick is scheduled for 6:00 PM.